Once upon a time Americans were proud of their country. Now the radical Left strives to convince Americans that we have nothing to be proud of. This radical mindset has taken over the education bureaucracy, the mainstream media, and the Democratic Party, operating on the belief that Americans should feel embarrassment instead of pride for their country’s history. Even worse, they seem to believe Americans must do penance before the gods of political correctness for their national sins. Out of many offenders, it seems that universities are a festering ground for political correctness, hatred of American history, and a vicious antipathy to patriotism. Read on to find out examples of leftist influence on college campuses. A student newspaper at JMU in Harrisonburg, Virginia, asked if JMU should change its name because James Madison himself had owned slaves. However, here there is a small ray of hope: 91% of the almost 2,700 respondents said no, with 5% saying change it and 4% unsure. Many comments in the survey suggested that the debate over slavery and the Founders needed more historical context. “Owning slaves was an economic reality of farming in James Madison’s times,” one student wrote. “We cannot nor should we try to erase history that we are uncomfortable learning about.” Another student suggested that the Founders “saw owning slaves like millennials treat owning a smart phone,” and while it was not “correct and moral” it is “part of our history and part of the society of the time.” Patrick Henry High School in Minneapolis is also debating its name. One member of the predominantly black student body, Semaj Rankin, helped raise awareness about Patrick Henry’s slave ownership. “The school should be renamed after someone of color or a civil rights activist,” Semaj said, “someone that has helped build something in this country.” Unlike, apparently, Patrick Henry. Appreciating what the Founders and their successors built— their achievements and legacy—is critical in evaluating how they should be remembered. 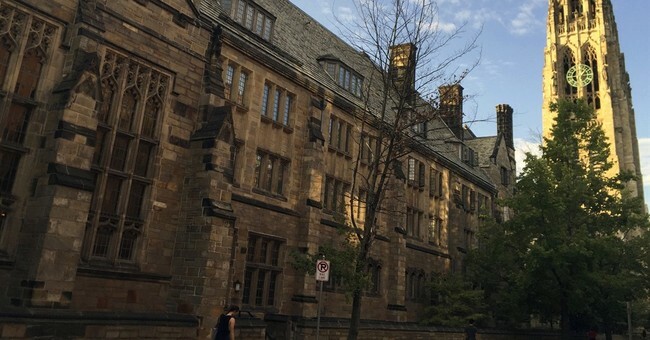 This idea came to the fore in 2016, when Yale University considered renaming Calhoun College, named for the South Carolina Senator John C. Calhoun, an advocate for both states’ rights and slavery and a member of Yale’s class of 1804. To evaluate Calhoun, the university’s Committee to Establish Principles on Renaming adopted the standard of “principal legacy,” defined as “the lasting effects that cause a namesake to be remembered.” The committee wrote that “we ask about a namesake’s principal legacies because human lives, as Walt Whitman wrote, are large; they contain multitudes.” Noting in passing that the university’s namesake, Elihu Yale, “served as the governor of an East India Company colony that engaged in the slave trade,” the committee chose not to delve into a historical question that threatened the three-hundred-year-old Yale brand. The New Criterion’s Roger Kimball noted that Elihu Yale was in fact deeply and personally involved in the slave trade, and profits from it accounted for part of the fortune that was later donated to the university. Any reasonable examination of comparative guilt, then, would drop the Calhoun inquiry and “concentrate on the far more flagrant name ‘Yale.’” But that was beyond the committee’s mandate. It determined that Calhoun’s principal legacy was at odds with the mission of the university, and the college was renamed. The slave trader Elihu Yale escaped - at least this time. Editor's Note: In the case below, the offending party was not the university itself, but a professor from a completely unaffiliated school who brought the charge again CUA. A complaint was filed with the Washington, DC, Office of Human Rights - supposedly on behalf of Muslim students at the Catholic University of America but by someone with no connection to the university or any of its students - complaining that the prevalence of Catholic symbols on campus hinders the Muslims from practicing their faith free of distractions. Crucifixes in classrooms, Catholic literature, pictures of the pope, and the presence of the massive Basilica of the National Shrine of the Immaculate Conception all allegedly contribute to an anti-Muslim environment. The complaint sought to have the university provide sanitized worship spaces. It is unclear why these students hadn’t suspected Catholic University might have a Christian flavor when they applied to go there—the name is a clue—or why they can’t simply “celebrate diversity” like their Christian classmates. This was the logic behind UCI for “planning inclusive celebrations.” The Office of Equal Opportunity and Diversity counseled that university departments and administrators should be “inclusive and sensitive” to “cultural and religious practices and celebrations,” and that one way to do this is to eliminate all mention of them. For example, “focus on celebrating a special occasion, instead of a specific holiday. Consider having a ‘Year End Celebration’ or celebrating seasonal themes such as Fall, Winter, or Spring.” “Display diverse symbols representing a variety of faith traditions along with secular ones.” And “ensure that office celebrations are not indirectly celebrating religious holidays.” Yet the same guidance provided a helpful link to the “The Official Kwanzaa Website”—the only holiday the office promoted—because omitting it would apparently not be inclusive. The University of Tennessee’s Office for Diversity and Inclusion issued a similar set of guidelines, titled “Best Practices for Inclusive Holiday Celebrations in the Workplace.” The guidance warned, “ensure your holiday party is not a Christmas party in disguise.” Decorations, food, and refreshments should “not be specific to any religion or culture.” And of course, keep “Secret Santa” under wraps, and dreidel is strictly verboten. (Ironically, dreidel originated with Jews in Maccabean times illegally studying the Torah when the Greek occupiers were promoting their version of diversity and inclusion by wiping out Judaism.) The UT guidelines were so offensive that some of Tennessee’s congressmen called for Chancellor Jimmy Cheek’s resignation, even though he had nothing to do with the incident. Congressman John Duncan, a UT alumnus, denounced the “extremism” of those behind the idea, saying “the people on the far left who claim to be tolerant seem to be tolerant of everything except traditional Christianity.” The guidelines were quietly withdrawn. Ole Miss, which used to hold a tree-lighting ceremony called “A Grand Ole Christmas,” replaced that tradition with “Hotty Toddy Holidays.” One presumes from the name that now it’s the students getting “lit.” One administrator explained that the traditional name “connoted too much Christianity on campus,” which of course it would since the event is a Christmas tree lighting. But like UC-Irvine and UT, Ole Miss wanted to have a more “inclusive” environment, so “Grand Ole Christmas” had to go. There are many other examples. The University of Minnesota’s College of Food, Agricultural, and Natural Resource Sciences noted that “decorations, music, and food should be general and not specific to any one religion” during “neutral-themed” celebrations. Even “bows/wrapped gifts” are “not appropriate for gatherings and displays at this time of year.” Actually, Christmas is the time of year when they’re most appropriate. The University of Maine banned “xmas trees, wreaths, xmas presents, menorahs, candy canes, etc.,” on campus, but permitted “winter themes, snowmen, plain trees without presents underneath, decorative lights but not on trees, [and] snowflakes.” The purported purpose of the ban, absurdly enough, was to make everyone “feel included and welcome on campus.” Missouri State cast the net even wider, cautioning against displays any time of year featuring crosses, nativity scenes, menorahs, stars of David, the Bible, the Koran, drawings of Jesus, or images of Mohammed (which would be doubly problematic). Santa Claus, however, somehow flew by the censors. Erika Christakis, an instructor at Yale, was driven from the school over an email questioning campus guidelines on politically incorrect Halloween costumes. The university’s Intercultural Affairs Committee, warning students against a variety of costume choices that might involve supposed stereotyping or cultural appropriation, reminded them that Yale “values free expression as well as inclusivity.” Professor Christakis’s open letter sought to generate a discussion on whether bureaucratic control over student costumes was better than having a reflective conversation among students themselves. She believed “the growing tendency to cultivate vulnerability in students carries unacknowledged costs,” suggesting that the micro-managing guidelines— seeking to forestall any possible offense—went too far. The result, of course, was outrage, as triggered students trembled with fear at even the suggestion that costume choice should be a matter of personal responsibility. “Nearly a thousand students, faculty and deans called for my and my husband’s immediate removal from our jobs and campus home,” Christakis wrote to The Washington Post. And in addition to demands for apologies and disavowal of her ideas, the self-important activists wanted “advance warning of my appearances in the dining hall so that students accusing me of fostering violence wouldn’t be disturbed by the sight of me.” Christakis, a registered Democrat, recognizes “the dizzying irrationality of some supposedly liberal discourse in academia these days” and believes this will continue until universities “declare that ideas and feelings aren’t interchangeable. It seems strange to have to make the case for loving and respecting America. Such feelings should be automatic. It is good to be proud of this country because, despite the revisionists, there is a lot to be proud of. This country was not built by slavery; it overcame and abolished slavery. This is not a land of rampant discrimination but of a people in active pursuit of the more perfect union. This is not a country of grinding exploitation but of limitless opportunity. It is not an imperialist country but the greatest proponent of freedom in human history.